This vegetarian recipe is a great meat-free option for entertaining, or as an alternative starter or main for Christmas Dinner. Grease a deep 20cm x 20cm square tin. Bring 750ml water to the boil in a large pan. Remove from the heat and pour in the polenta in a steady stream, stirring continuously. Return to the heat and simmer, stirring all the time, for 4-5 minutes or until thick. Stir in both cheeses and half of the thyme leaves. Season well, then spoon evenly into the prepared tin. Set aside in a warm place. Heat the butter in a large frying pan. Add the mixed mushrooms and the rest of the thyme leaves. Season well and cook for 6-8 minutes. Increase the heat and add the garlic. Cook for half a minute, then pour in the red wine and cook for a further 2 minutes. Turn out the polenta, which should be firm to the touch, onto a chopping board. Cut out 4 rounds using a 9-10cm round cutter. Place on warmed serving plates. Top with the mushrooms and a dollop of crème fraîche. Serve with rocket leaves, drizzled with a little Cooks' Ingredients Balsamic Glaze. 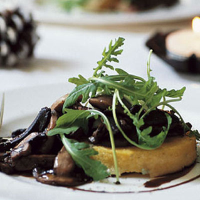 You can prepare the mushrooms and the polenta rounds in advance. Chill the day before or freeze for up to a month. Heat the mushrooms thoroughly in a frying pan and reheat the defrosted polenta in a preheated oven for 20-25 minutes at 180°C, gas mark 4 until piping hot.